If you don't want any spoilers about the Chilling Adventures second season finale, don't read any further, OK? The second season of Netflix's Chilling Adventures of Sabrina ends with a coronation ceremony of hellish proportions. While working with Sabrina and her family and friends to defeat the Dark Lord after he returns to his human form, Principal Wardwell - Miss Lilith if you're nasty! - devises a plan to bind him to another human vessel and bring him back down to Hell so he can't continue wreaking havoc on the mortal world. Sabrina's boyfriend, Nicolas Scratch, takes one for the team and volunteers to be the vessel; he does this to save the world, sure - but mostly because he feels like a total d*ck for agreeing to work for the Dark Lord to influence Sabrina in the first place. And as it turns out, the history behind the name Nicholas Scratch could have been a clue to his satanic devotion (and hellish fate) all along. In old-timey New England (you know, where the Salem witch trials took place! ), the devil became colloquially known by euphemisms like Old Nick, Old Scratch, and Mr. Scratch due to the "nicking" and "scratching" that his cruel influence could inflict on one's soul. To this day, my own New England-born mother uses the name Mr. Scratch to refer to anyone who says they're "playing the devil's advocate" in an argument - so you probably see where I'm going with this. First, let's head back to 1824, when essayist Washington Irving wrote the short story "The Devil and Tom Walker." The tale follows a greedy, selfish New England man and his equally greedy wife who essentially sell their souls to the devil, who is referred to throughout as "Old Scratch." The devil became colloquially known by euphemisms like Old Nick, Old Scratch, and Mr. Scratch due to the "nicking" and "scratching" that his cruel influence could inflict on one's soul. It heavily influenced a poet named Stephen Vincent Benét, who in the 1930s wrote his own short story called "The Devil and Daniel Webster." In it, a New Hampshire farmer also sells his soul to the devil - who also refers to himself as "Mr. Scratch" - and is defended by a fictional version of the famous attorney and US statesman Daniel Webster. You might even remember that Webster also shows up in Chilling Adventures as the lawyer who represents Sabrina during her trial against the Dark Lord in season one's "The Trial of Sabrina Spellman." Back to Nicholas Scratch: after taking on the form of a hot, naked fallen angel, the Dark Lord confesses to Sabrina that he tasked Nick with getting close to her so she would devote herself to the church and stay on the path of night. You could say that by accepting this act of devotion to the Dark Lord, Nick was quite literally playing the devil's advocate. Sabrina is furious and feels utterly betrayed by her boyfriend, of course, so Nick begs for her forgiveness and insists that his feelings for her are real. He even goes the extra mile by offering to be the human vessel for the Dark Lord, knowing he'll be taken away from the mortal world and probably never see Sabrina again. Has a man ever gone that far to apologize? I highly doubt it! Theories emerged during season one that Nick was the devil himself, largely due to the origins of his character's name as well as his undeniable charm and wit. While we now know that's not entirely true, it still fits, given that the devil is living in Nick's body. 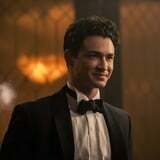 His name may have been the biggest possible clue about his true leanings and connection with the Dark Lord - and judging by Sabrina's plan to "go to Hell" and get her boyfriend back, it appears she's either forgiven him or at least wants more answers.